People living in the world’s mountainous areas are particularly vulnerable to climate change. East Africa is no different. Mountains cover 20 per cent of Africa’s surface area and east Africa is one of the most mountainous areas with several peaks above 4,500 metres. It is home to the three highest mountains on the continent: Kilimanjaro (5,895 m), Mount Kenya (5,119 m) and the Rwenzori Mountains (5,109). A new UN report titled ‘Sustainable mountain development in East Africa in a changing climate’ finds out that extreme weather events like floods and droughts are altering the landscape and causing severe human, ecological and economic impacts. East Africa’s mountains, unlike their counterparts in other parts of the world, support large human populations. The Ugandan side of Mount Elgon has a population density of 900 people per sq km. High population density is due to cooler temperatures, more stable and predictable rainfall and more fertile soils compared to the lowlands. According to the 2014 Intergovernmental Panel on Climate Change Fifth Assessment Report, Africa’s average temperature has risen by at least 0.5°C during the last 50–100 years and it’s likely to increase by 3.2°C by 2080. Such an increase in temperature will affect the suitability of commonly grown crops like maize and generate a need to introduce other crop types. Rainfall patterns are also showing signs of change and a decline has been observed in the rainy season that runs from March to June. The impacts of climate change have been evident in crop failures and famine. The increasing number of floods and droughts has degraded productive agricultural land. With the majority of mountain population living on small farms, the excess pressure on land leads to deforestation, leading to further land degradation. Due to the small size of land holdings, 50 to 60 per cent of the population lives in poverty in East Africa’s mountains. Since the main source of livelihoods for such communities is agriculture, more and more hilly areas are being cleared for settlements and farming. The slopes of Mount Elgon, for example, have become highly prone to landslides due to a combination of unsustainable land-use practices, high population densities and sometimes due to heavy rainfall. 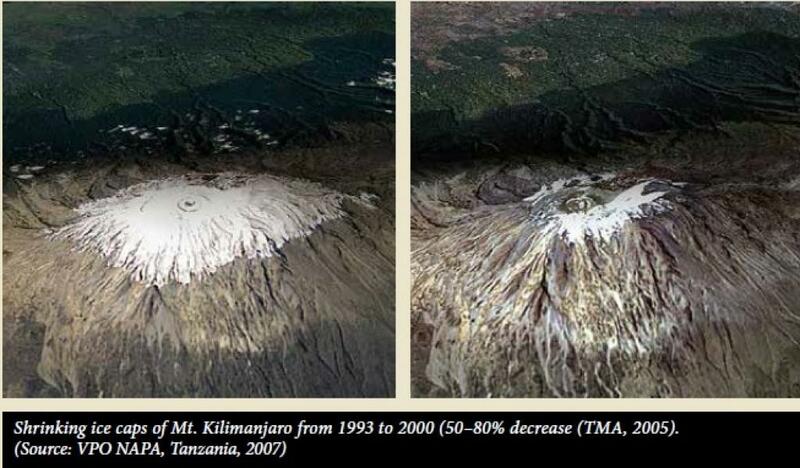 East Africa’s mountain glaciers have shown significant decline in the last few decades. Since the 1990s, surface area of most glaciers in the region has decreased by 80 per cent. It is projected that glaciers will totally disappear within a few decades. Mount Kilimanjaro, the highest mountain in the continent, has seen consistent melting of its ice caps. The ice fields atop Mount Kilimanjaro have lost 80 per cent of their area during the last 100 years. As a result of the receding ice cap and deforestation, rivers are drying up, affecting the forests and farms in the lowland. 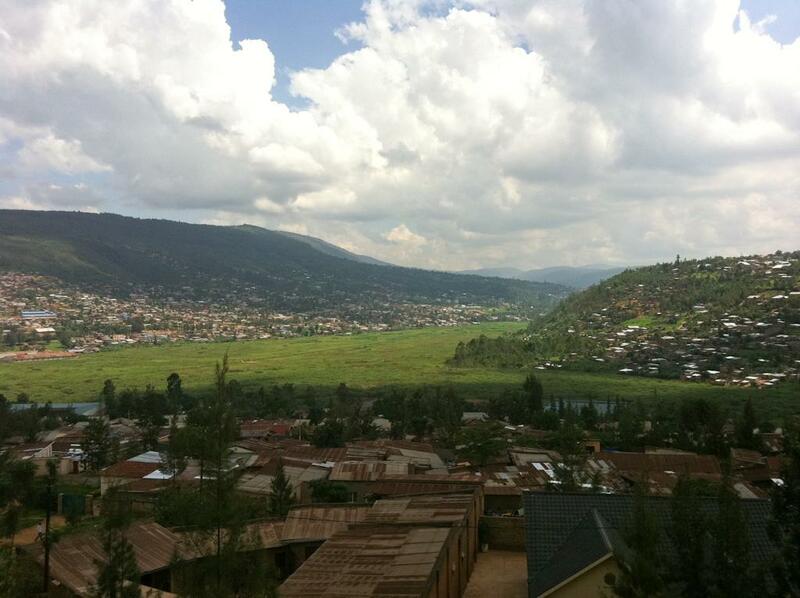 Currently, there is a serious water shortage in the town of Moshi (Tanzania) located on the foothills of the mountain. It threatens the livelihoods of the Chagga people who are highly dependent on river water for irrigation systems. Water shortages during the dry season are becoming increasingly common, especially on the lower foothills. Women and children face the maximum burden since they have to spend a large part of the day fetching water. There has been a documented increase in forest fires on Mount Kilimanjaro. Due to a drier climate, the incidence of wildfires has increased and that has changed vegetation composition and displaced the forest line to a lower altitude. The severity of the damage is reflected in the fact that here has been 25 per cent decline in water flow from the mountain. 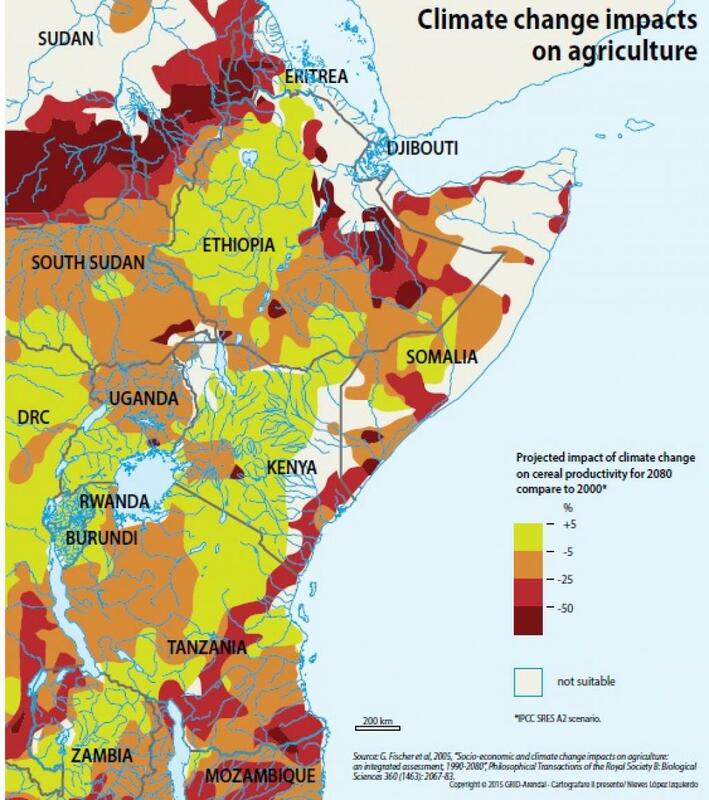 Climate change, according to the research quoted by this UN report, has caused a browning of the vegetation in East Africa, indicating that the land is either degraded or the productivity has been affected. Access to electricity is one of East Africa’s key constraints. As of 2014, less than 20 per cent of the population has access to electricity. Firewood and charcoal are the most common form of energy for cooking and heating in rural areas. This is despite the fact that rivers that flow out of the mountains have significant hydropower potential. There are several rivers that are not prone to drought and can provide a continuous source of power. Better access to electricity would contribute to energy security, and hence, put the pressure off forests and reduce deforestation. It will also help in alleviating poverty, improving health, increasing productivity and economic growth. While there are climate change policies and institutional frameworks for implementing sustainable mountain development programmes, they do not specifically focus on mountains. The majority of the countries in this part of Africa do not have mountain-specific institutions to drive the mountain agenda. Misinterpretation of laws and regulations by different institutions and inconsistencies in the allocation environmental functions often lead to ineffective implementation of sustainable development policies. There is need to integrate issues of climate change adaptation and resilience into development policies, plans and strategies. Policies and institutional frameworks need to be reviewed and harmonised to make the mountain development agenda more relevant to the changing climatic conditions. The study also recommended policy coordination between countries and regional economic communities.